In this clip from the series Rusty Rivets, Liam gets stuck in a hot air balloon after trying to save his football, Rusty and Ruby try to help but they end up flying through the air too! Watch this clip celebrating Rusty and Ruby's fabulous friendship! Look out for all their amazing inventions throughout, which one is your favourite? When Botasaur gets tired from playing, Rusty builds him a bigger battery and with it comes a lot more energy! See if Rusty and Ruby can keep up, in this clip from the series Rusty Rivets. In this clip from the series, Rusty Rivets, Rusty and Ruby try to help Mr Higgins learn some dance moves, but the suit they invent gets a little out of control! Rusty and Ruby modify their pirate ship to go in search of buried treasure, but Frankie Fritz gets there first! See what happens, in this clip from the series Rusty Rivets. When Rusty builds rocket skates instead of learning how to skate, he discovers that short cuts aren't always the best idea! 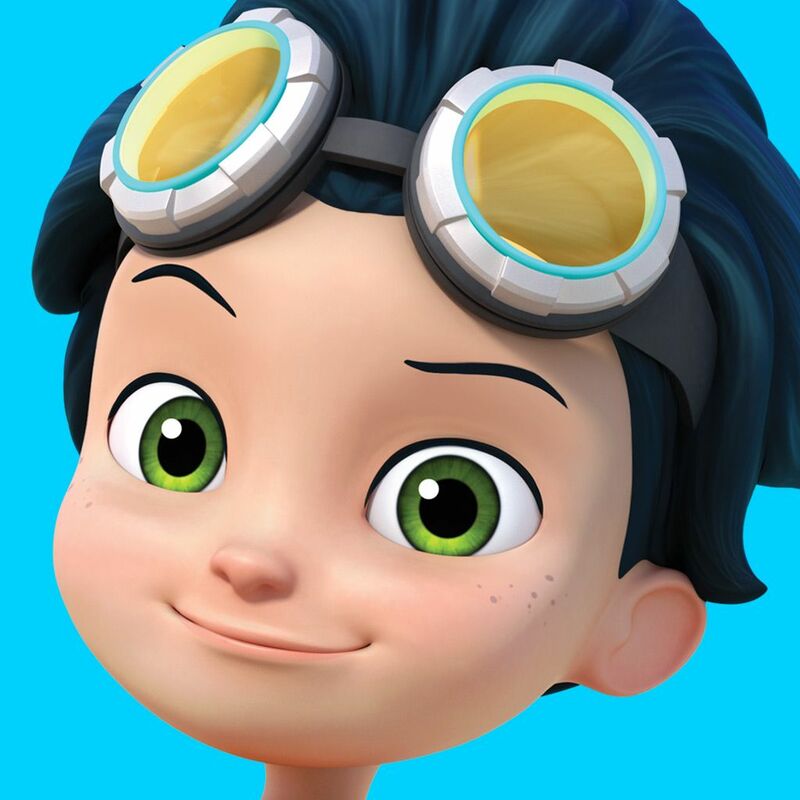 Find out what happens in this clip from the series, Rusty Rivets. Officer Carl has lost his lucky sculpture and suspects someone has taken it, so Rusty and Ruby help him find the culprit, in this clip from the series Rusty Rivets. If you can dream it, you can build it! Sing along to the theme tune from the series Rusty Rivets in this musical clip. The bits escape from the yard and go into town in search of balloons! Will Rusty and Ruby be able to find them? Find out in this clip from the series Rusty Rivets. In this clip from the series Rusty Rivets, Rusty, Ruby and Ranger Anna work together to shelter some giraffes from a sand storm! When Ranger Anna finds herself stuck up a tree, Jeremy the Giraffe proves no help! Rusty and Ruby come to the rescue with the Mobile Rivets Lab in this episode from the series, Rusty Rivets. In this clip from the series, Rusty Rivets, Rusty can't get to the beach because he keeps stopping to help his friends. Will he ever make it? There isn't enough Rusty to go around, so Rusty decides to make a robot of himself to solve the problem, in this clip from the series, Rusty Rivets. In this clip from the series Rusty Rivets, Ruby invents the world's stickiest glue! The glue is so strong that it can stick humans, animals and robots to the ground! Rusty, Ruby and Liam go in search of a monster, but they're rather surprised by what they find! Find out who or what it might be in this spooky clip from the series, Rusty Rivets. In this clip from the series Rusty Rivets, Chompers the beaver has a sore tooth and needs help building a dam, so Rusty and Ruby get some bits on the fix! In this clip from the series, Rusty Rivets, Rusty and the gang help Mr Higgins fix his broken bulldozer, but it ends up causing mayhem all over Sparkton Hills! Rusty and Ruby get their thinking caps on, when Botasaur is in need of a new fort, in this clip from the series Rusty Rivets. Rusty and Ruby try to come up with a new act for three cheeky monkeys, but can they get them to stay in one place long enough? Watch this clip of the series, Rusty Rivets, to find out! Rusty and Ruby come across a ninja fish, who's stolen Ruby's tablet! Will they get it back? Find out in this clip from the series Rusty Rivets. In this clip from the series Rusty Rivets, there is a peach recipe contest in Sparkton Hills and some of the residents need a lesson in teamwork!